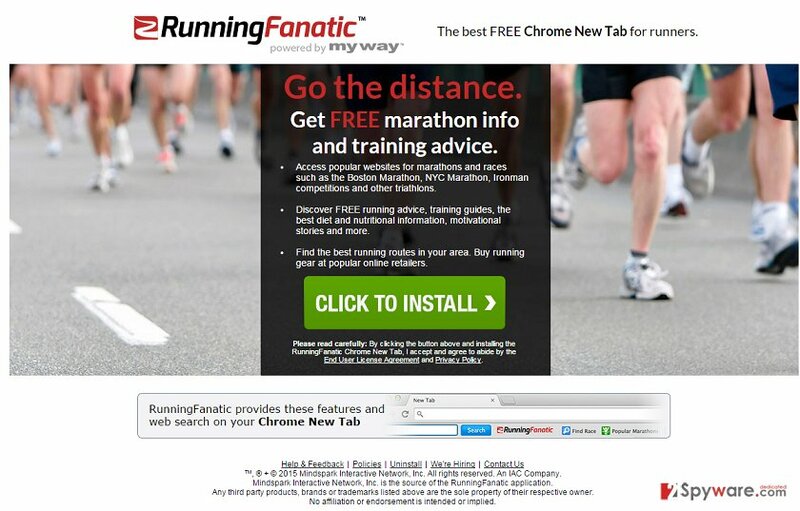 Running Fanatic Toolbar is the PUP that uses misleading techniques to prevent removal. Use Reimage to locate malicious components and get rid of them faster than with uninstall instructions. A full system scan blocks virus reappearance and prevents traffic to malicious domains. What is Running Fanatic Toolbar? How can Running Fanatic Toolbar infiltrate my computer? How to remove Running Fanatic Toolbar? Running Fanatic Toolbar is yet another dubious application created by Mindspark Interactive. The very fact that this application has been created by this company signals that it needs to be removed as soon as possible. This developer has already created tens of suspicious app, including SparkleBox Toolbar, SmartBar Toolbar, JokeFanatic Toolbar and many others. Be aware that such and similar toolbars usually appear to be stubborn programs and may initiate various unwanted operations on user’s computer. Regarding Running Fanatic Toolbar, it’s worth mentioning that it may infiltrate your computer bundled with another freeware. It may be introduced as an app that may inform people about coming marathons and provide training advice. Unfortunately, once installed Running Fanatic Toolbar may replace your start page, search provider, and a new tab within Google Chrome, Mozilla Firefox, Internet Explorer and may start initiating a serious havoc during your browsing. It may set Ask as your default homepage, search provider and you may not be allowed to restore your web browser’s settings. This way, it may provide you with altered search results and may flood you with annoying commercial advertisements. Running Fanatic Toolbar redirects are employed to make you visit predetermined websites and increase income for its developers. We highly DO NOT recommend clicking on the links provided by this search site because you may be redirected to suspicious third-party website and expose your PC to suspicious or even malicious content. By the way, Running Fanatic may also track you and collect personally non-identifiable information about your browsing habits. To prevent information leakage, system slowdowns, redirects to suspicious websites and similar issues, we recommend you to remove Running Fanatic Toolbar using a reliable anti-spyware. Recently, the developer of this program contacted us asking us to remove this post from 2-spyware.com website. We believe that we shouldn’t do that as long as programs that we offer for the removal of Running Fanatic Toolbar can detect it and help users to remove it from the system. As it is mentioned under each of download buttons, we ARE affiliated with these anti-malware programs, and while some of them are free, others can remove a virus only after purchasing them. These mentions fully fulfill each of the requirements of FTC. 2. When in the Add/Remove Programs/Uninstall a Program, look for Running Fanatic Toolbar and other programs that are unknown to you. 2. Here, select unfamiliar plugins (Running Fanatic Toolbar, MyWay, MyWebSearch, etc.) and select trash icon to delete these entries. This entry was posted on 2015-03-23 at 01:46 and is filed under System tools, Viruses. You can quickly scan the QR code with your mobile device and have Running Fanatic Toolbar manual removal instructions right in your pocket. How did you remove Running Fanatic Toolbar?